When I first began my business, I decided to kick things off with a $1000 Makeover. I also added a Mini Makeover in for fun. Here are the results. First, meet Michael Mastalski who entered for his parents Elaine and Mick Mastalski of Altoona. Michael wanted to give back to his parents who in Michael's words "have been so giving to me the past three years as I pursued my Masters and now PhD degree. I want to win so that I may give back to them, not for myself. Unfortunately, it will be a while before I can do anything of this magnitude for either of them. I want to win because they deserve recognition for what they do for me and I know will continue to be selfless and giving about as well until I complete my degree." Michael Mastalski and his parents, Elaine and Mick. When I met with Elaine for her consultation she showed me a Pier 1 picture that she loved. We decided it would be a great inspiration piece for their bedroom and bathroom. Elaine and I looked at some design styles and I discovered she likes things a little glitzy. The challenge for me was to give her that while keeping it masculine enough for Mick. I was able to achieve that by selecting a bronze pinched taffeta fabric for the duvet cover and a linen for the tailored bed skirt. Black cord trim and some dupioni silk pillows added to the luxurious blend of fabrics as did the pillow sham fabric which also peeked out underneath the kick pleats on the bed skirt. Visit my Blog page within the site for Before and After pics of the Makeover rooms including project ideas! Next, meet Patty DeRosa of Ebensburg who won the Mini Makeover. Patty entered after having a rough year fighting cancer and many complications since. She says "I know everyone has something, and there are so many people who have been through so much more than me, but needless to say, this has been one heck of a year for me and my husband! 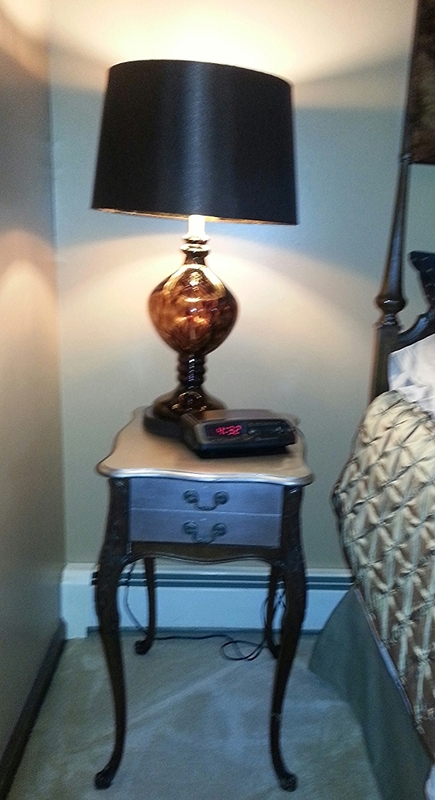 It would be awesome to have this bedroom redone and have one less thing to worry about!" When I met with Patty, I told her I would be painting her ceiling and walls; we selected a jade color. Patty said that she thought the window seat in her room could be made pretty and wasn't quite sure what to do with the other oddly slanted windows, having considered stained glass before. My 'faux real' stained glass windows were custom made to fit these windows. The window seat area was painted out in a milky white color and adorned with shelves, custom curtain rod made from repurposed salt and pepper shakers, a chandelier, pillows made from vintage linens and artwork, featuring a picture that was done by a relative. Patty and her husband Jim love the room and I must admit, it didn't take me long to love them too! If you like the makeover rooms and other rooms pictured on the site, contact me below or call 814.934.8928 for a FREE consultation. What do you have to lose? What space(s) in your home needs a fresh look?